Expectations: I’ve seen this a bunch of times, I expect to still enjoy it. Fargo is a twisted tale that begins with a disclaimer that it is based on a true story. The Coens put this on their film because there are certain elements taken from true events, but the actual overall story is theirs. This doesn’t diminish its impact at all, in fact, it’s such a well-written story in its probable improbability that you can easily believe it to be true, which in the world of film is all that really matters. Jerry Lundegaard (William H. Macy) drives down a snowy road to meet two men at a bar. He has hired these men to kidnap his wife, in an effort to get her wealthy father to pay the ransom which Jerry will use to pay off debts and then give a small share to the kidnappers. It’s all so ludicrous that it has to be true, right? I mean, you can’t make that kind of stuff up. 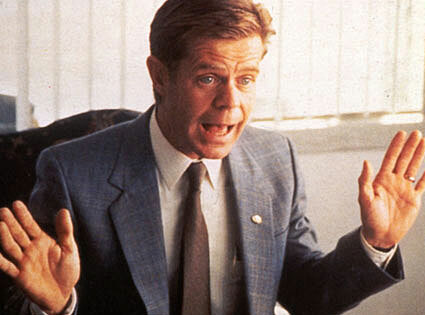 William H. Macy is perfect in his role as Jerry. He plays the small-time auto salesman in over his head to the letter and you almost feel sorry for the guy when his plan starts to go South. When the criminals you’re hiring to pull your jobs are questioning your motives and the viability of your plan, maybe you should rethink it. But not Jerry Lundegaard. See this plan will work… it’s a good one I tell ya, you just gotta do it like I say. His crackpot scheme remains riveting, even after multiple viewings. 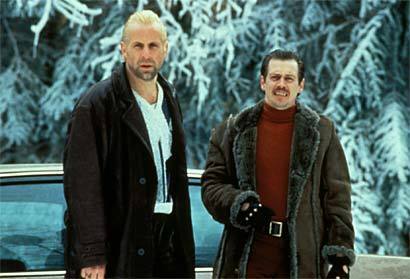 Steve Buscemi and Peter Stormare are like the criminal odd couple, stuck together whether they like it or not. Often when I watch this film, I wonder how they met each other. They are such polar opposites of each other and their scenes are filled with conflicts over the most minor of things, such as stopping for pancakes now or later. These are some of the funniest and most enjoyable scenes in the movie, as two great, relatively unsung actors are handed a great script and they absolutely run with it. The true star of this film, though, is Frances McDormand as Marge Gunderson. The choice to write a pregnant woman character into the role of the town sheriff on the hunt for the criminals is a stroke of brilliance and something I doubt we’ll ever see again on screen. It’s a choice that’s truly inspired, but easily could have been corny or ridiculous. McDormand is so charming and has such an air of wit and power about her though, that she is ultimately believable in her role and not a thing seems forced. John Carroll Lynch is perfectly cast as her husband as well, and the scenes they share possess a true sense of marriage and love and, like everything else in Fargo, is incredibly believable. This is one of the great on-screen relationships and every time I watch the film I am re-enamored with it. Little things like that are what sets Fargo apart from the rest of the fairly tired, standard thriller genre. Such care is placed on every minute detail, making this one of the most re-watchable movies of all time. On top of all of this is the beautiful photography of Roger Deakins, one of my favorite cinematographers. He skillfully captures the desolate, snowy landscape of Brainerd with calm, crisp shots that tell a story. There’s a great shot early on of Jerry talking on the phone to a GMAC lender who needs some auto serial numbers from him. It is a revelatory moment for the viewer as a background piece of info as to why Jerry is trying to get his hands on some money is revealed. The scene is shot through the office’s open window blinds, which as the camera moves closer become nothing more than vague, out-of-focus vertical bars, suggesting that Jerry will not pull off his plan and will end up in jail. It’s a subtle use of visual symbolism that works well without seeming heavy-handed. Throughout the years, the only piece of the film that perplexed me was the Mike Yanagita character. I could never quite understand why he was there, other than for possible straight comic relief. This time around, I think I figured it out. His character states that he recently lost his wife. He’s in a desperate, lonely state and reaches out for the loving Marge in an effort to reclaim some part of his past that is still alive. Marge isn’t able to reciprocate, but she is ultra-polite about it and continues their get together. My mistake in trying to figure out Mike was that I was always asking myself, “What does his character tell us about Marge?” This time I noticed how as a man who has lost his wife, he can be placed alongside Jerry instead. Mike is a man who has lost the woman he loved, despite his best efforts, and Jerry is the complete opposite. He is a man who would do anything, even have his own wife kidnapped, just to not look bad. The most chilling example of Jerry’s cold-hearted nature comes in a scene when he comes home after Jean has been kidnapped and practices the distressed, manic voice he will use when he calls her father. This is where the Coen Brothers struck their first motherlode. 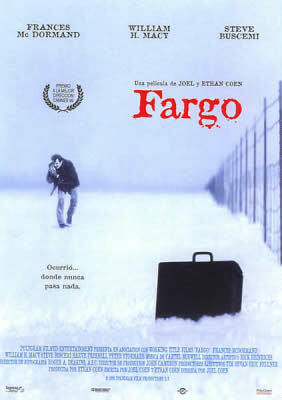 Their previous films are all good in their own ways and each has their set of fans, but for me, Fargo is the first Coen masterpiece and it’s one of my favorite films. If you haven’t seen it, do yourself a favor and take a trip to the cold, barren wasteland of Brainerd, MN. I’ve never seen that first movie poster but it’s great. I really like that design. 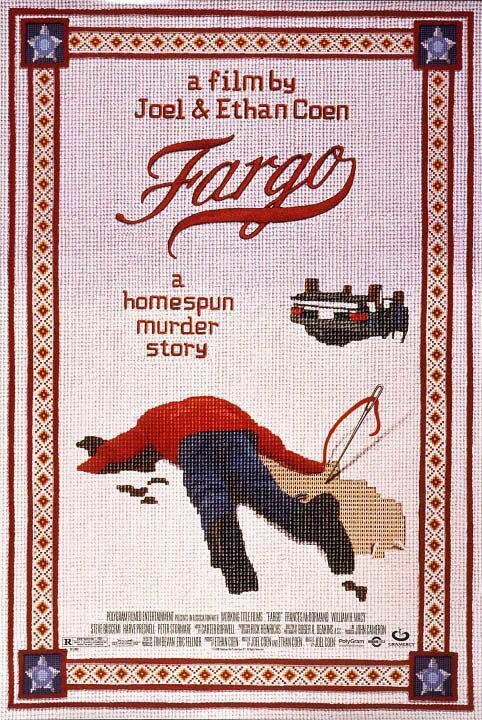 I agree with you about the qualities of Fargo, a terrific piece of work and my second favourite Coen Bros. film. Like you discuss above, the casting is fantastic even if they are Coen regulars – Buscemi, McDormand, Macy – just seem made for these roles. This is my fave performance by McDormand. Yeah I love that first poster. I hadn’t seen it in years until I was searching for the images. What’s your favorite Coen Bros? I think my #1 is a three way tie between Fargo, Lebowski and No Country. If I were to make a list, I think the Coen’s films would be the hardest for me to put into an order. They’re all different and great in their own ways. 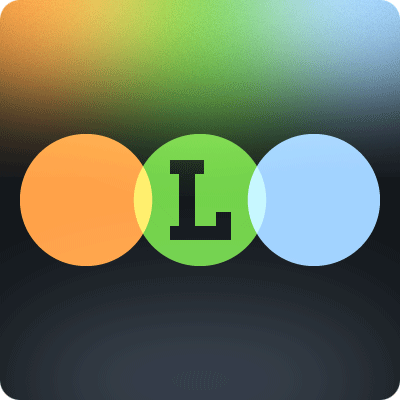 I think this is a brilliant film, and you do a great job of analysing why. The Mike Yanagita character confused me too, but I think your idea about this character makes a lot of sense.